The experienced professionals of Weed Pro offer Lawn Mowing Services. We are a locally owned and operated company. This means they are well versed in the proper way to mow the different grasses that grow in the Regina area. We know when to mow and how to mow, which helps to keep grass healthy and lush. 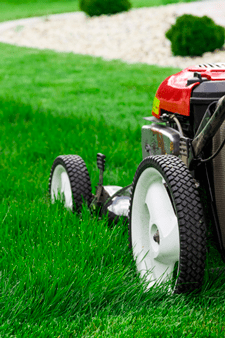 Our lawn equipment is also properly maintained, so we cut your grass with a nice sharp blade. And on top of that, we free up valuable hours so you have more time to spend with your family. Don’t spend your weekends mowing grass while your neighbors are enjoying theirs. Contact Weed Pro today and let us put our experience to work for you. You can expend a lot of time and money on fertilizing, aerating, seeding, and watering, but without proper mowing techniques, you won’t achieve the results you desire. Regular weekly mowing is another service Weed Pro offers. The service seems pretty straight forward, and it is, but here is our commitment to our customers that makes us different. We are punctual, we will mow your lawn once a week. If due to rain we are unable to mow your lawn, you will be notified by email and once the rain stops your lawn will be mowed next in que as though it never rained. We sharpen our blades daily. Every single day our mowers cut roughly the same amount of grass as a home owner’s mower would cut in a whole season. This means our mower blades need to be sharpened daily to cut the grass blades cleanly as opposed to tearing them and making the grass plant susceptible to disease. We will adhere to any specific instructions you may have for us, like: close the gate, make sure the downspouts are put back as they were, don’t come on such and such a day, knock to make sure the dog is brought in before starting, etc. Our vehicles are clean and branded so you know who is pulling up to your property. Likewise our team is always in uniform. We are licenced, insured and are always in good standing with WCB. Our staff is friendly and approachable. We are here to help you with a servant attitude. We answer our phone, we reply to emails and text messages. We are committed to open communication. We strive to do our best, but when we fail, we will make it right, quickly and willingly. If we damage something, we will communicate that with you right away, rather than trying to be sneaky and hoping to get away with something. Quite frankly, we want to be your lawn care provider forever, and we are willing to do what it takes to earn your trust. Lawn not looking so good?